This is one of those days the crafty world gets a big guffaw at my expense. And you find out just how crazy my life is! A while back, I received a request to participate in a Pinkfresh Bloghop….I wrote it down for today, and responded to the request as such, but never heard back. I looked for the original request so I could reach out again, and haven’t found it. Yep. Haven’t located it. Didn’t hear back from their contact page either so…maybe I dreamed it! But between all the social media platforms that have added DM capacity, messages are getting lost! I’m finding this with LOTS of people, so if you’ve tried to reach out to me and haven’t heard back, you might be stuck in one of 20 DM locations somewhere that I don’t check often enough. Email or use my contact page – then you end up in my searchable inbox at least! So I never did find out if I’m part of a Pinkfresh bloghop today or if I’m just a one-woman hop celebrating their watercolors alone. LOL. In any case….I’ve got a stamp set and a video! If you’re coming here from a hop then welcome to my crazy world – and if not and you want to see more blog posts, go see if they have something going on today! REMINDER : CHARITY ART AUCTION ENDS SEPT 30! GO BID! Today’s watercolor is SO easy – you’re gonna love it! 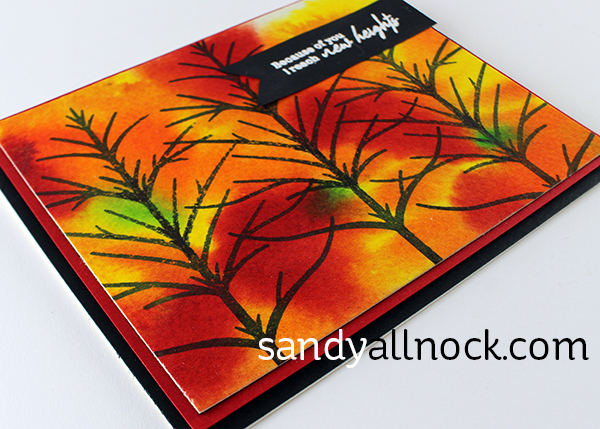 Make a bunch of really pretty fall or winter cards in a snap. Watch the video below or click HERE to see it in HD on YouTube. The fall trees are just so beautifully RICH! And that SKY! I think I’ve been working too hard…this was a bit of a ‘throwaway’ method and it’s so pretty that I surprised myself! Two fabulous cards, like both equally I think. Hope your ok & healthy as the weather changes, usually the time we pick up cold bugs as we still cling to summer with t shirts not jumpers. Take care & I look forward to more of your work. 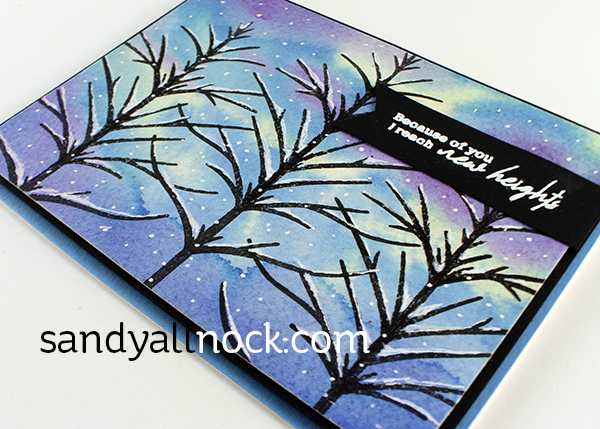 I’ve fallen in love with the winter card the colours are very subtle yet very atmospheric – love it !! Oh wow Sandy, these are just gorgeous! I’m with you on the DM – much easier if people just email!! That technique is so effective and you make it look so easy . 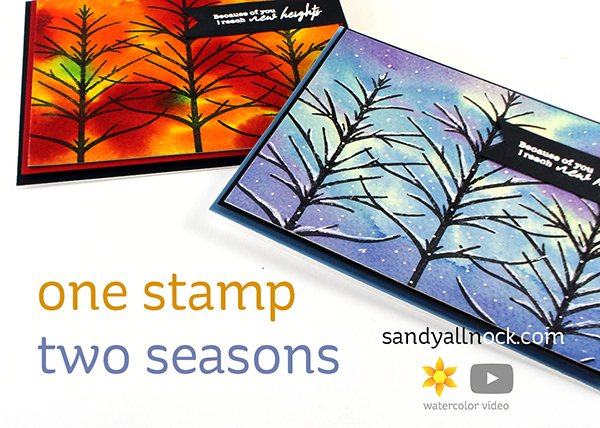 Simple stamps made into absolutely beautiful cards! Love your creativity and talent Sandy! Thank you for sharing your time and talents with us. Awesome cards Sandy, I love fall colours but from these two the winter one is my favorite, so gorgeous!Thanks for sharing. Why did’t you put the point of your bruch in to the bottle instead of dropping to much ink on your brush? Too hard to stick it in without splitting the brush head. Thank you for your answere, I am a bit late but I couldn’t find my question anymore. WOW! Gorgeous winter and fall tree scenes! Great cards, Sandy. Thanks for sharing such a great technique for these sky backgrounds. They make a wonderful background for the Fall/Winter trees.